Keswick is a market town now mainly tourist orientated due to the many thousands of tourists visiting every year and the majority of side streets are abundant with B&B’s. Derwent Water is about 3 miles long by 1 mile wide and sits on the south edge of Keswick town and is fed and drained by the River Derwent. The river also connects Derwent Water to Bassenthwaite Lake which is north of Keswick. There are several islands in Derwent Water the largest being Derwent Island on which stands the inhabited 18th century Derwent Island House. The house is a tenanted National Trust property open to the public on five days each year. Lords Island was also home to a grand looking house and a drawbridge but in the late 18th century the house fell into disrepair and only the foundations remain now. The stone from the house was used to build Moot Hall in 1813. Moot Hall in the centre of Keswick was once the town hall but is now a tourist information centre and it is here in the square where the market is held every Saturday. During the 16th century Keswick was home to copper and lead mining on a small scale and the town was also the source of the world’s first graphite pencils. The pencil industry continued in the town until 2008 when it then moved to Workington. The Cumberland Pencil Museum and the Mining Museum are both close to the centre and are excellent places to visit on rainy days. 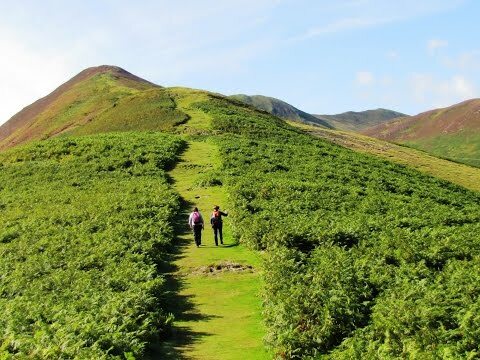 Barrow at 455 metres (1494 feet) is situated in the quiet and very pretty Newlands Valley. Although it is one of the Lake District’s lower fells it provides a wonderful all round view taking in the surrounding higher North Western Fells, the Helvellyn Range across Derwent Water, Skiddaw rising above Keswick and Blencathra beyond. The southern edge of Bassenthwaite Lake can also be seen and to the south-west of the summit are the higher fells of Causey Pike, Sail, and Crag Hill and to the north-west is Grisdale Pike. The summit is a small cairn on grass surrounded by heather. Barrow is a slender ridge climbing south west from Braithwaite with the valley of Newlands Beck on its east side and the valley of Coledale on its north-west side. In the past Barrow, along with many of the fells in the Newlands Valley, was extensively mined for lead the spoil heaps are extensive and sweep down to the road at the eastern foot of the fell. Barrow mine first opened in the 17th century and closed in 1888. Outerside at 568 metres (1863 feet) is a smaller fell of the Coledale group of fells. Its summit is marked by a cairn and like Barrow the views extend to the Helvellyn Range and the Skiddaw Group. To the west and south the higher Coledale fells of Grisdale Pike, Crag Hill and Sail and to the south-east Causey Pike. The view directly down into the Coledale Valley with Force Crag Mine at its head is wonderful. The small ridge that runs north east from Outerside crosses Low Moss to reach the subsidiary top of Stile End at 447 metres (1466 feet). We walk past the school towards the village and at the t-junction we turn right across the front of the pub then turn immediate left. We head forwards crossing over the bridge and past the little shop on our right. After a short way we turn right onto the track going slightly uphill. At Braithwaite Lodge we bear right between the buildings. We go through a second gate, turn immediate left and follow the path as it bears right leading up to the summit of Barrow. From the summit we head forwards downhill and after a short way the path splits we take the left path. (There is a path going off to the right to Stile End omitting Outerside for a shorter walk.) We keep heading forwards to pick up the distinctive path we can see in front of us. We eventually come to a small cairn and turn right to the summit of Outerside. At the top we keep heading forwards downhill, steep in places, into the dip then back uphill to the summit of Stile End. We keep heading forwards following the path steeply downhill. The path levels out and we continue to follow the path back to Braithwaite. This is a moderate to hard walk on well trod paths and tracks with a short stretch of quiet road. There are steep inclines and declines. Elevation: approx lowest point 85.7m (281.2ft) approx highest point 564.48m (1852ft) approx ascent 1015.4m (3331.4ft). Approx 5 miles allow 3 to 3½ hours using OS Explorer Map OL4, The English Lakes, North Western area. This walk is done clockwise. Start point: at the side of the road near the school. Braithwaite is west of Keswick just off the A66 in the Lake District, Cumbria. Travelling on the A66 take the B5292 and Braithwaite is situated just off the A66. Parking: Free roadside parking around the village. The village school also provides parking at weekends and in the school holidays only. There are no public toilets the nearest ones are at Keswick. For refreshments there are two pubs in Braithwaite the Royal Oak and the Coledale Inn and a small shop. There is also the Middle Ruddings Hotel close to Braithwaite on the A66.